When you get as much snow as Lake Tahoe does in the winter you can bet all that water has to go somewhere. And go somewhere it does. 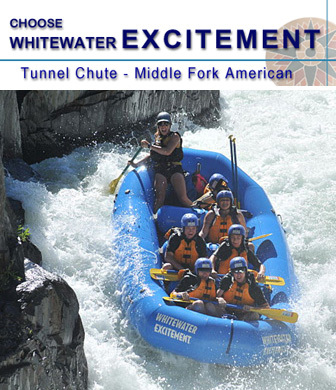 There are numerous opportunities for whitewater adventures at all levels. Within the industry the slogan is "from Mild to Wild!". From the serene beauty of Emerald Bay to the gentle flow of the Upper Truckee as it leaves the lake to the class IV rapids of the tunnel chute the Tahoe area has everything even an avid paddler could want. There's no shortage of commercial outfitters prepared to fill your every need as well. It's not difficult at all to rent a kayak just about anywhere near the lake. Many ski rental shops in the winter turn into bike/kayak rental shops in the summer. If you're planning to paddle on the lake you will want a longer thinner kayak than if your planning anything on rough water. There are numerous rivers to run both on the east and west sides of the Sierras. The majority can be accessed from Highway 49 as the rivers pour out of the Sierra from Coloma to Downieville. Here is a quick rundown of the favorites. The links will take you to more information about the run. Looking for paddling gear? Check out our rafting and kayaking gear section. Click here additional paddling, rafting, and whitewater resources.